One of the most overlooked details in t shirts are their tags. When I say tags, I am specifically talk about the tags hidden away on the inside of your shirt. The tag that never sees the light of day, and is usually an afterthought. So after coming across some incredibly creative tags that in my mind add value and personality to a brand I decided to put together a list of companies that do an incredible job with their custom tags. Some of these companies use silk screen tags, providing maximum comfort and that non-itchy woven tag and some of these companies opt for the custom woven tag, which to me comes off a bit more professional. 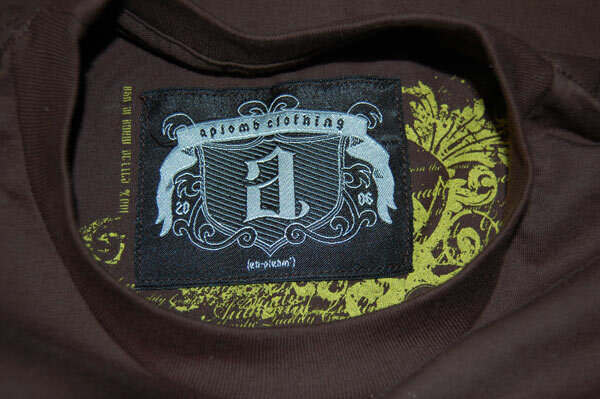 I even found one brand that uses both a woven and a silk screen tag for the ultimate combination of awesomeness! Whether you prefer the woven tag or the silk screened tag I think we all can agree that the t shirt tag is becoming an art of it’s own. Here for your viewing pleasure are 17 custom tags from 17 different upcoming and established indie brands. Do you have a favorite? Leave comments below! These are really creative, thank you for sharing! Some great tags, thanks for sharing your finds. Would be interested in knowing of any companies selling unique Hoodies. I just started a new blog and I'm looking for great Hoodie designs to write about. I am actually writing a article about some awesome hoodies to pick up for the holdiays, should be out today or tomorrow! where do you get the glamour kills tag from? Check out my custom heg tags for Opus Dei Clothing! Geat website with very informative information. Really what the collection guys, so impressive I really want to buy these types T-shirt. Thanks for the post. Do you have any recommendations for companies that can make custom embroidered shirts with custom tags? im trying to do my own tag but dont know were to make it can some one help ? Recently i tried to create a tag on my own but wasn’t successful, maybe i am not that artistic, these tags are nice but not like the one i wanted, i don’t know if there are any softwares which can help to make them.